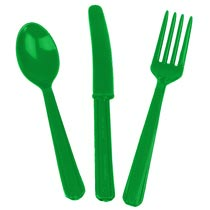 Kelly Green Plastic Forks 24ct. Kelly Green Plastic Teaspoons 24ct. Kelly Green Plastic Knives 24ct.